This Fiber Optic Termination Shelf can be mounted in 19" frame installations. The Optronics 1U Fiber Optic Termination Shelf is design for indoor fiber management which can be configured in many ways. Optronics 1U termination shelves can be combined to create specific solutions and meet your application needs. They can also hold many of the standard industry adapter types like the ST, FC, SC simplex, and LC duplex. • Mount in 19" frame installations. • Slide-Out features and front mounting panels for ease installation, inspection and testing. • Electrostatic powder coated paint. 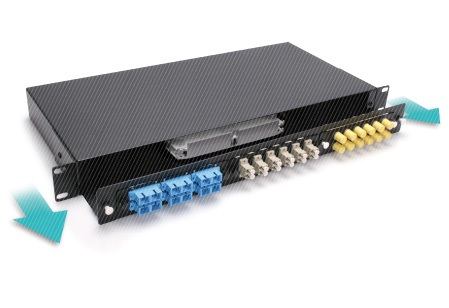 • Slot for 3 modular panels, up tp 36 ports capacity. 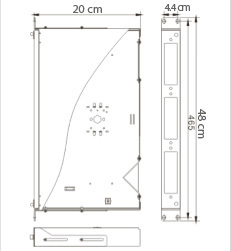 • 2 shelves capacity for 12 to 24 splices.